Sebastian Vettel won at home for the first time after he saw off Kimi Raikonnen to win a dramatic German Grand Prix at the Nurburgring. Lewis Hamilton - who qualified in pole position - came fifth, but managed to overtake former teammate Jenson Button in the final lap. Lotus took second and third place with Kimi Raikonnen and Romain Grosjean. Raikonnen was ordered to overtake Grosjean with five laps remaining, meanwhile he held off Fernando Alonso. Vettel controlled the race following by passing Hamilton at the start in the first corner, but Raikonnen almost hindered his attempt to win. The safety car played a factor when it closed up the field and Vettel found himself fending off Raikonnen and Grosjean. It was deployed because Marussia suffered an engine failure. 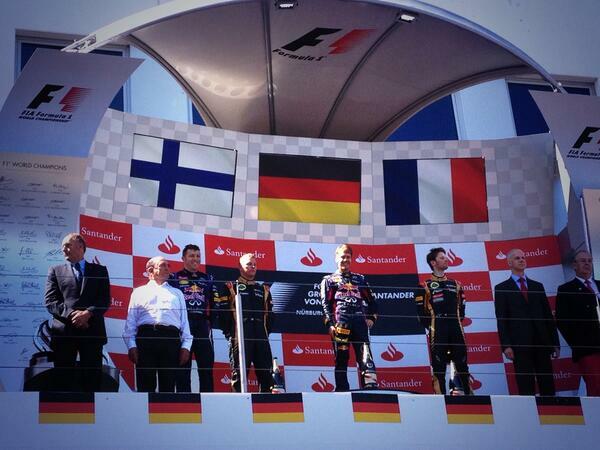 This marks the first time that Sebastian Vettel has won in Germany, and this also marks his 30th Grand Prix win. Vettel talked about Raikonnen challenging him for the win: "Kimi was pushing very hard in the race, they tried to do something different with different compound tyres." Alonso could have snatched fourth when he was 0.7 seconds behind Grosjean, but as he approached the flag his team immediately told him to pull of at Turn One. Hamilton's tyre wear made it challenging for him, but following his final pit stop he managed to overtake Jenson Button to take fifth place. Webber took the final points position, but at one point in the race he was second, until a wheel came off when he accelerated after his first pitstop. A cameraman was hit by Mark Webber's car during the pitstop, he was part of F1's Official TV company. He remained conscious and is now being checked out at hospital. The FIA has confirmed that the cameraman hit by the loose wheel is conscious & under observation in hospital. More to follow. Raikonnen later suggested that he could have won in the event of him not pitting in the latter stages of the race. Sebastian Vettel's win puts him 34 points clear of Alonso, marking a very successful day for the German who wins at home for the first time.